A waterproof fitness tracker means you can dive into a pool or jump into the shower on a morning and not have to worry about whether you're going to damage your wristband. Not all fitness trackers are waterproof though. More and more trackers are waterproof though as the technology has become far more common. It used to be a technology reserved for high-end devices, but now even some far cheaper devices like the Xiaomi Mi Band 3 are even able to take a dip. Just because they're high end fitness trackers doesn't make every Fitbit device pool worthy either. Here we're going to run you through every product made by Fitbit that's water resistant. Now we may use the term "waterproof", but it's worth noting that doesn't mean these trackers can go anywhere wet and do anything when submerged. Each of these trackers have limits, and we've put what you need to know about each at the the end of each entry. Which Fitbit trackers are waterproof? The latest product from Fitbit is waterproof, and it's the first in the Charge line-up that you'll be able to take in the pool. 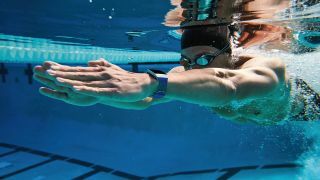 Fitbit's first smartwatch is also waterproof so you can take in the pool, and it's one of the best Fitbit products to track your swims. Fitbit's second smartwatch is waterproof and capable of tracking your laps up and down the pool. Much like the standard Fitbit Versa above, the Versa Lite is also water resistant despite the fact it's cheaper than the company's other two smartwatches. The Fitbit Inspire and Inspire HR are two of the company's latest fitness trackers, and both are capable of being submerged. They don't track many swimming stats though, so you may not want these if you want to monitor your pool time activities. The first time Fitbit made a water resistant product was the Flex 2 that was announced late in 2017, and it's currently the cheapest waterproof Fitbit. Fitbit's only tracker for kids is also what the company calls "shower-proof" but it doesn't recommend taking it in the pool. As well as knowing how deep you can take your Fitbit, the company also has some advice on what you should do after taking your band in water. The official Fitbit website has a note in the waterproofing section for each of the products above (apart from the Fitbit Ace) that states the following: "After swimming or getting the band wet, we recommend drying the band because, as with any wearable device, it's best for your skin if the band is clean and dry. We do not recommend wearing Charge 3 in a hot tub or sauna." If you're interested in further details of how you can protect your Fitbit and your comfort when using one of its products around water, the company has even more details on its website here.